Over the past few decades, dental implants have become the premier way dentists around the world replace any number of missing teeth. As a certified prosthodontist who is an expert at rebuilding smiles, Dr. Steven Feit believes that implants are the most complete missing tooth solution available today. With them, he’s helped countless patients reclaim their smiles and confidence at the same time, providing a solution that is the next best thing to nature. What makes dental implants so special? They are the only restoration that brings back the entire structure of a missing tooth, both the crown and the root. Traditional bridges and dentures only replace the crown above the gum line, which inherently makes them unstable and likely to break down over time. Implants, because they are built just like natural teeth, look, feel, and act just like natural teeth as well, providing a solution that seamlessly blends into any smile. They work by placing an artificial root directly replacing your missing tooth , and this is used to support a variety of dental restorations creating strength, stability and function that show within the smile. These roots create the ideal foundation for the new teeth, and they also support the jawbone from within, stopping and even preventing the bone loss that is common after tooth loss. No other treatment can do this! The procedure has a 98% success rate, and with the proper care, implants can easily last for 30 years or more. How many teeth would you like to replace? One, a few, or do you require a full denture? Implants are an excellent option for patients dealing with any degree of tooth loss, and Dr. Feit can design restorations that are perfect for any smile. We can attach a beautiful, natural looking all-porcelain crown to a dental implant root using a small connector for strength. 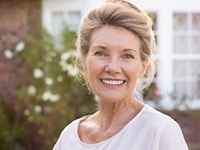 Unlike other practices, we can also offer mini dental implants, which are smaller roots that are ideally suited for people who have thinner jawbones due to longstanding tooth loss, making implants a viable option for a wider array of patients. 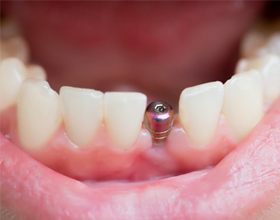 For patients with consecutive missing teeth, implant crowns can also be attached to additional prosthetic teeth to form a strong and reliable bridge. This is a much more cost-effective way to replace multiple teeth than using an implant per tooth, and implant bridges are guaranteed to look better and last much longer than traditional ones as well. By having more space between the implants the bone can be stronger and the implants can last longer. This is best determined case by case through a comprehensive exam process which is routine at this office. In order to make sure our patients receive the highest level of care throughout their implant journey, Dr. Feit has partnered with some of the best dental specialists in the country to perform the implant placement surgery. Many of them have worked with Dr. Feit for years, ensuring that a visit to their office will feel like an extension of his. After a patient has received their implants and been given time to heal, they’ll return to Dr. Feit so he can personally design and attach their new teeth to complete their smile. In order to make sure our patients receive the highest level of care throughout their implant journey, Dr. Feit has created a team approach with some of the best dental specialists in the country to perform the implant placement surgery. Many of them have worked with Dr. Feit for years, ensuring that a visit to their office will feel like an extension of his. After a patient has received their implants and been given time to heal, they’ll return to Dr. Feit so he can personally design and attach their new teeth to complete their smile. 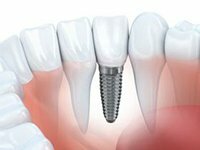 As we touched on above, the dental implant procedure is usually broken up into two separate parts: placement of the implant by the surgeon and placing the tooth or teeth by Dr. Feit.. The cost of either of these procedures can vary quite a bit from patient case to patient case depending on their particular situation. How many teeth are going to be replaced, where they are located, jaw relationship, bite relationship and a patient’s need for preparatory procedures can all influence the final price of implants. 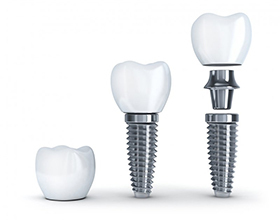 While dental implant restorations do tend to be more expensive than traditional bridges or dentures upfront, they are usually the most cost-effective option overall long term, and not just because of their superior appearance and function. Regular tooth replacements typically need to be completely redone every 7-10 years, compounding their cost, while dental implants can easily last for 30 years or more. This makes them a onetime cost for most patients, helping them save thousands of dollars and hours spent in the dental chair compared to other options. Dental implants are comprehensive, which means the process for receiving them can be complicated at first. It’s also a highly customizable treatment, which means you can replace many teeth in a number of ways. However, once you Dr. Feit goes over the process in more detail during your implant consultation, you’ll have the confidence to get started on your journey to a new and improved smile. When it comes to replacing teeth, there truly is no other solution quite like this!